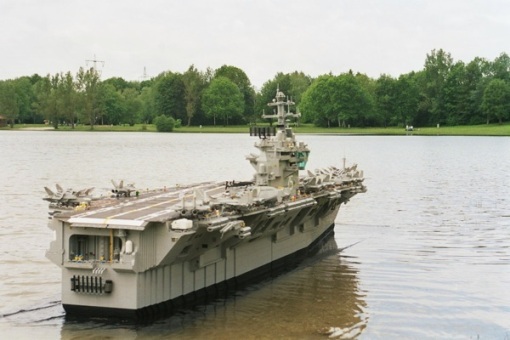 It took $20,000 worth of plastic gray bricks, but Malle Hawking of Munich, Germany, has built a LEGO replica of the USS Harry S. Truman, one of the US Navy’s nuclear aircraft carriers. As you can read in his story, he was inspired by the Discovery Channel documentary “City of Steel,” about the ship’s construction, sea trials, and launch. Check out the full image gallery of this amazing feat of bricksmanship at Brick Shelf. The LEGO version consists of the Harry S. Truman is composed of over 200,000 bricks and weighs in at an astounding 350 pounds! It features moving radar dishes, a motorized catapult, and working lights! It also boasts a full compliment of airplanes and tiny plastic flight crews in life vests. Even more amazing, he managed to assemble this ship and somehow maintain his marriage. If you thought making a matchstick Minas Tirith was tough, imagine having to explain to your wife that you spent $20,000 on toys!